ChemSee offers two different types of detection kits for Arsenic. 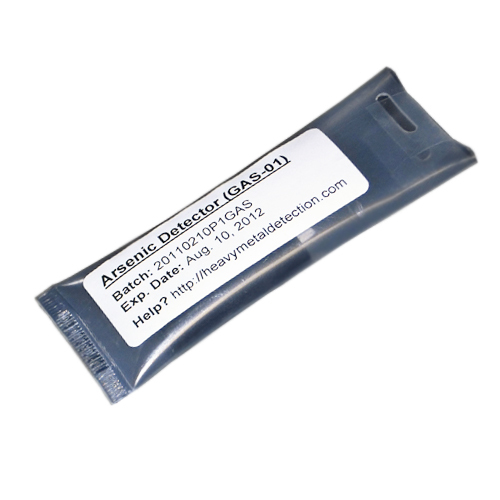 Trace Detection – AJLOW-01 Arsenic Detector – Capable of detecting as low as 1 ppb (part per billion) of arsenic. This is used to test drinking water and commonly eaten food items to check if natural Arsenic consumption is happening. Testing with the AJLOW-01 allows a person to test sources of potential chronic arsenic poisoning with confidence. 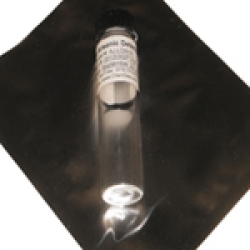 Intentional Acute Poisoning – AJ-05 Arsenic Detector – Capable of detecting arsenic that may be intentionally added to a food or drink for the intention of harming a person. The AJ-05 detects as low as 500 ppb (parts per billion), and does so to make sure that naturally occurring Arsenic doesn’t create a false-positive. The AJ-05 Detector for Arsenic rapidly and easily detects Arsenic that may be added intentionally to Food and Drink. Detection Limit of 500 ppb (parts per billion) to prevent false-positives. A simple color change alerts the user if Arsenic is present. The detectors can be used to test water or urine for the presence of Arsenic. Full instructions are provided to ensure that all tests are performed properly. Testing for Arsenic can be completed in less than TWO MINUTES. A reference color chart is provided for interpreting the test results. Accurately and semi-quantitatively detects trace amounts of Arsenic as low as 1 ppb (part per billion). Meets EPA standards for Arsenic in Drinking Water. Test foods / wine which may naturally contain large amounts of Arsenic to see if you are being contaminated. Tests can be done at home quickly and easily. Results are seen as a color change which can be compared to the provided color chart. Two types of arsenic poisoning can be distinguished: Chronic & Acute. When a person absorbs very small amounts of the poison over a long time, CHRONIC poisoning will occur due to the CUMULATIVE effect of the arsenic. Small amounts of arsenic are absorbed by the body every day from drinking water, food, vapors and contact with some pesticides. The symptoms of chronic arsenic poisoning includes headaches, confusion and drowsiness. As the poisoning develops, convulsions and changes in the fingernail pigmentation may occur and heart and breathing difficulties follow. Chronic exposure also causes lack of sleep and exposure to certain Arsenic compounds, such as Arsenic Trioxide, is known to greatly increase the risk of cancer. ACUTE poisoning occurs when a relatively large amount of the poison is absorbed in a short period of time. Large amounts of arsenic may be absorbed by the body when an accident happens which involves arsenic compounds or when an intentional attempt is made to poison a person. The symptoms of acute arsenic poisoning are initially similar to the symptoms of chronic poisoning, but happen over a much shorter period of time. When the exposure to arsenic increases, it causes vomiting and diarrhea, and blood will begin to show in the urine. The victim’s muscles will cramp, hair lose will occur and the person will have severe stomach pain and convulsions. The organs of the body that are usually affected by arsenic poisoning are the lungs and heart, the skin, kidneys and liver. Finally, the victim with go into a coma or die.